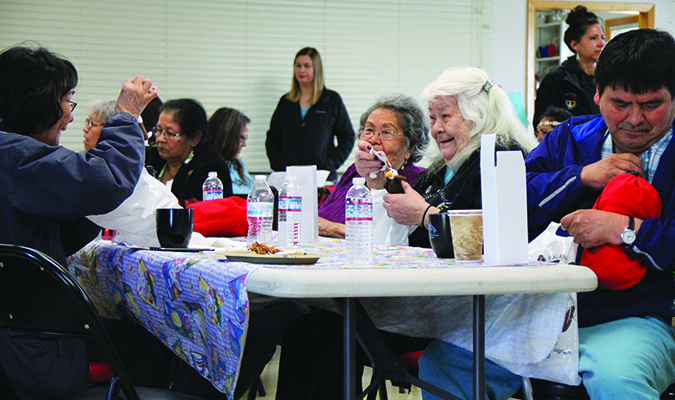 The Tulalip Tribes Problem Gambling Program continued their month-long Lifting Our Community Through Recovery concept, in recognition of March as Problem Gambling Awareness Month, by hosting a special elder’s luncheon on Friday, March 24. 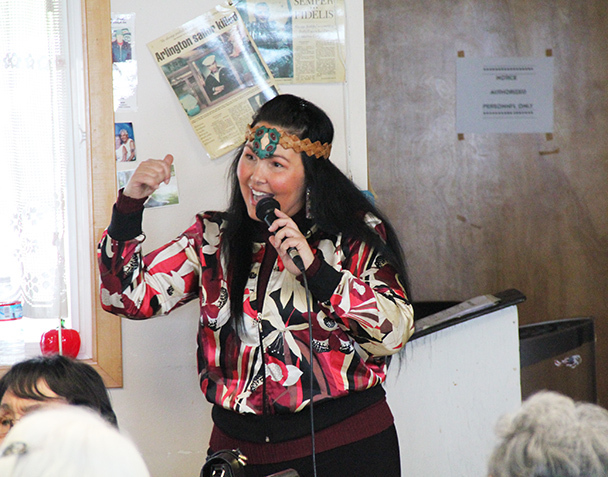 Held at the Senior Center, close to 50 elders were in attendance as the program celebrated the wisdom and strength our elders share in the Tulalip community, while acknowledging problem gambling as a disease that can be defeated. 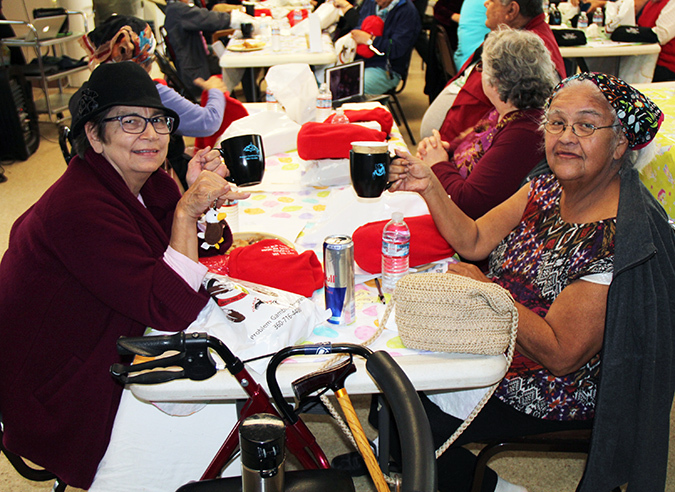 A delicious buffet style meal was catered by Ryan Gobin’s Rezipes for the elders to enjoy while listening to members of the gamblers anonymous community share their personal experiences with problem gambling and their victories over it. In the mainstream, compulsive gambling can often be portrayed as an issue of morality, creed and lack of willpower; something that is a personal choice. However, science has proven compulsive gambling is much more than a decision made from lack of willpower. It is in fact a disease. “Gambling addiction is a real disease, and impacts communities at the individual, family, extended family, community and society level,” explains Sarah Sense-Wilson, Problem Gambling Coordinator. “Older adults have a number of additional vulnerabilities and risk factors, such as medical conditions and health problems. These issues can render some older adults less active, thereby limiting their social and recreational activities. Isolation, grief and loss, boredom, and having more time (in retirement) can all be additional factors that contribute to older adults being more vulnerable to a gambling disorder. Gambling addiction has been recognized by the mental health and medical community for nearly 40 years now. There are brain changes that explain why people can’t stop gambling and feel a need to be in a casino sitting at a slot machine or playing a table game. Like asthma or diabetes, there’s no permanent cure for compulsive gambling, but it can be controlled to the point that you are not worrying about it every day. Tulalip tribal member and elder, Toni Sheldon, understands this all too well from her own battle and triumph over the addiction. “Recently, over the past few years I started to gamble. It started with going to the [Quil Ceda Creek Casino] for lunch to socialize with friends and former co-workers. While socializing, I’d make my way over to a slot machine and play forty-cent bets,” recalls Toni. The betting amounts began to increase little by little, while her trips to the casino became more frequent. Eventually, the losses were adding up and becoming noticeable to those closest to her. The tipping point came when Toni’s caregiver reviewed a copy of her win-loss statement with her just to show how much money she was putting back into the casino. Following the shared stories and experiences with gambling addiction, the atmosphere continued to be uplifted by the Grammy-winning musical talents of Star Nayea. 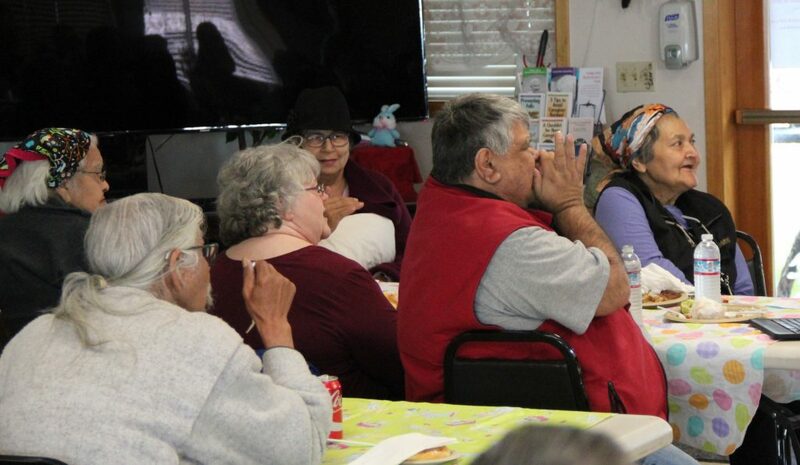 Tribal elders danced in their chairs and sang along as Star performed their favorite songs to end the luncheon. For those who may be wondering what the options are for someone with a gambling problem, Sarah Sense-Wilson and Problem Gambling Program is here to help in any way they can. This entry was posted in News, Top Story, Tulalip News and tagged elders, Gambling addiction, Tulalip Tribes by Kim Kalliber. Bookmark the permalink.